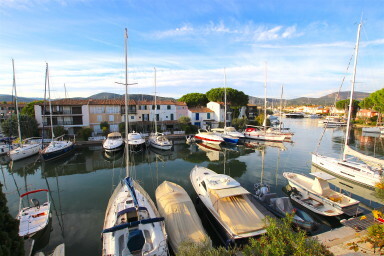 Pretty 2-room apartment in a private area in Port Grimaud, close to the facilities. It is located on the top floor of a small building and is composed of a living-room with an open kitchen, a bedroom and a renewed bathroom. On the canal side, a wide balcony perfect to enjoy sunset. A 12,50m x 4,30m mooring at the bottom of the building. A cosy base perfect to relax after sailing.